I have some questions about the basics of the publishing business on the writer’s side. I keep hearing terms that I don’t understand; can you please explain them? Sure. You'll want to invest in a couple books about the publishing process if this is something you'll be spending your creative energy doing. Start with Writers Market. The essays and information, even aside from the listings, will help you. You can read a copy in your library, but this is one book I advise everyone to actually buy at least once, and read often. What EXACTLY is an advance? Does an author every have to pay money back if the advance is never earned by the sales? An advance is "an advance against royalty payments". The publisher pays the author some portion of the money the publisher thinks the author will earn from royalties. The author doesn't have to pay it back if the book doesn't sell enough. How are royalties typically figured? Do you have to sell a certain number of books to fulfill the advance, then start getting royalties? Yes. And you get something like 6% of the cover price of each book you sell after that? Does an author give 15% of royalties to the agent? Yes. Technically the agent sends the author 85% of what the agent gets from the publisher but you've got the right idea. Only 15% of deals we make, or deals that come from that deal. We don't get 15% of your income teaching or your tax refund. Just the book stuff. What is “earn through” or “sell through”? Is that when your books earn your advance? And what of “returns”? How long does a bookstore typically keep your books, and how many do they return to the publisher and why? Chain stores 6 weeks if it's not selling. Indie stores maybe 3 months. They return everything they can't sell. How many they can return is subject to their buy agreement with the publisher. Industry wide returns are 25-35% of a print run. Will they always keep one or two just in case? What exactly does the term "stylish" mean when describing a book, not Miss Snark's wardrobe? I once attended a $120 seminar given by a self-publishing guru who travels the country teaching people "how to get published." The whole point of her seminar was that it was impossible to get published by a mainstream press. Therefore, self-publishing was the only realistic option for would-be writers. During this seminar, she gave an explanation of what an "advance" was. It's not entirely clear to me how she knew about advances, since she had never been published outside of POD. Anyway, she made the statement that authors had to pay back advances if their books didn't earn them out. She claimed that Hilary Clinton had to write a huge check to her publisher becuase her book didn't earn back its advance. I tried to verify this story on the web, and found nothing. This is what I paid $120 for. And this was a seminar held at UNLV. That's why I'm glad blogs like this exist. Miss Snark at her best. Just good old fashioned (do those have gin in them?) straight answers to legitimate questions. 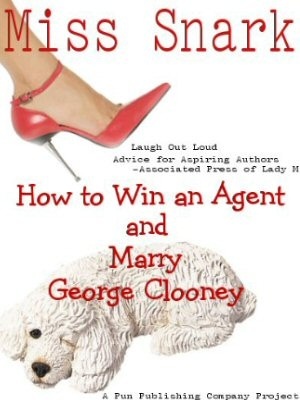 I did notice no talk about stalking the Clooney or diving deep into the gin pail. Heaven forbid, Miss Snark behave herself on the weekend. Thanks for answering my email so quickly, Miss Snark, and for showing us what's what. I just finished reading a handful of your posts. Thanks for all of the great information. Personally, I have a difficult time selling myself in a query letter. I get rejected more than a pimple faced geek at a school dance. I'll be looking for some Proactive in your archives over the next few days and see if I can't fix that little problem of mine. Have a great weekend! Check out the crapometer from August when Snarklings sent query letters and I eviscerated them with a stiletto heel. "We" all had lots of fun. Great post. I've always wondered about "sell through", but I've been afraid to look too much like a noob. Thank you Miss Snark for your blog. I have learned so much. It has helped me to convince my family and friends that is what I really want to do since I can give a basic run down of the financial side or that it seems I know what I'm talking about and not just jumping into something cold. Lies, Damned Lies...and "common knowledge"
Good news..you won! Bad news...you won! "The courtesy of a quick look"
Please Miss, Can I have another? Writing Conferences...again, and again some more. One for the money..two for the ..what? Thank god! Back from the Wilderness!